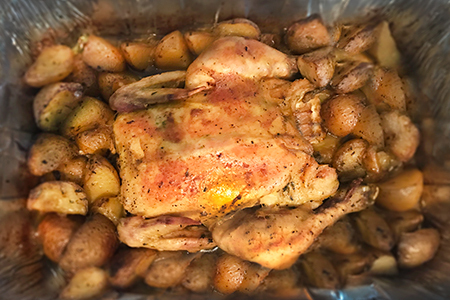 This is a classic roast chicken dish that has been passed down from my grandmother to my mother, to me and now to you! Growing up, my mom always made this dish for holiday occasions and I love that I am carrying on this tradition with my family. One of the star ingredients in this recipe is Turmeric, which is packed with nutrients and antioxidants. Turmeric contains curcumin which is anti-inflammatory. It is important to include anti-inflammatory foods in your diet since chronic inflammation can lead to a host of conditions and diseases. Pair this dish with a grain, a warm veggie, and a cold salad, and you’ll have yourself a complete holiday meal. Add olive oil to a skillet and saute chopped onion until translucent. Cut potatoes in four and add olive oil to coat, and salt & pepper to taste. Place the defrosted chicken in a roast pan. The one I used is 9×12. Place the browned onions and herbs in the chicken cavity. Add the minced garlic under the skin. Massage the spices, lemon juice, 1 tbsp olive oil, and salt & pepper on the chicken. Place the potatoes around the chicken.